The Château de Villandry, one of the last large castles built along the Loire, is known for its six gardens – a pleasure garden planted with tall box hedges, a “classic”-style water garden, etc. – and its fabulous decorative vegetable garden which extends for nearly two and a half acres. Tradition is still respected today: every winter the 1,016 lime trees are pruned, occupying four gardeners for eight weeks. Using what is known as “cat’s head” pruning. This is a traditional pruning technique which contains the tree development and maintains a structured shape. A “cat’s head” is a growth at the end of a branch resulting from repeated pruning of shoots at the same place. The rings of scar tissue merge together, enlarging the head and gradually forming a complex ligneous mass. Trees regularly maintained with this type of pruning store a large proportion of their reserves of starch and sugar in the heads, providing extra longevity. The space between the heads should be no less than 40 cm, or there is a risk of inducing the decline of the tree. delicate silhouettes of yew trees (Taxus baccata) in the topiary style, vegetables and flowers, scents and savours, calmness and energy, tranquillity and effervescence… the Château de Villandry unveils its remarkable gardens and smells. Villandry, finished in 1536, is the last of the large castles to have been built on the banks of the Loire during the Renaissance. In the 18 th century, a new lord of Villandry had the large service quarters built in a classic symmetrical style, on either side of the forecourt, and re-arranged the interior of the castle by adapting it to the standards of comfort of the time. 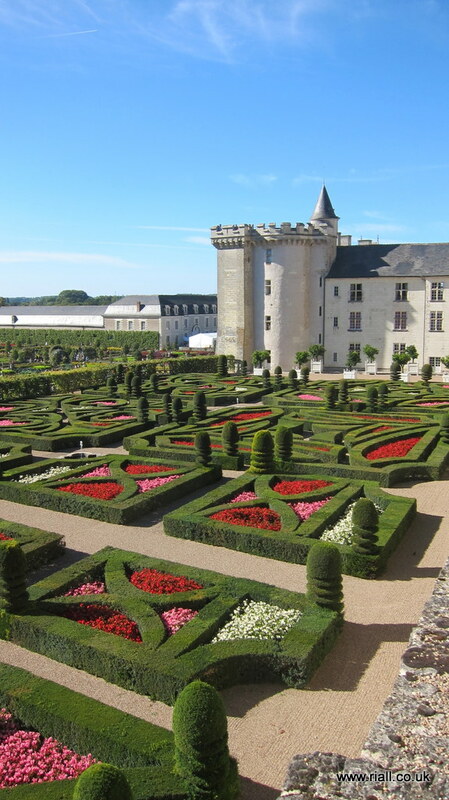 The castle’s gardens are the reconstitution of a 14th century French garden based on ancient texts. These gardens are divided into four terraces: an upper terrace with the Sun Garden (created in 2008), followed by a terrace with the water garden surrounded by a cloister of Lime, followed by a terrace with the decorative, embroidery, garden with sculpted box hedges and yew trees in the topiary style, and finally a lower terrace with a decorative vegetable garden, it also displaying embroidered shapes. The decorative garden – or gardens of love – located above the exceptional vegetable garden, extends along the castle’s drawing rooms. Climbing up to the belvedere will give you the opportunity to enjoy a magnificent view of the entire gardens of love, divided into four sections: tender love, passionate love, fickle love, tragic love. The water garden at the far south of the gardens is a classic creation based around a pool representing a Louis XV mirror and surrounded by a botanical cloister of linden trees. The maze planted with arbours, where the goal is to find spiritual awakening as you make your way to the central platform. The garden of simples, consisting of aromatic and medicinal plants, traditional in the Middle Ages. The Renaissance vegetable garden. It is composed of nine equally-sized squares but inside of which the geometric patterns are all different. This garden recently featured on a BBC TV feature with Monty Don, who alas seemed to go everywhere when it was raining. I have been lucky enough to visit Villandry on 3 seperate occassions and every time the sun was shining !